Background There is a paucity of data on long-term management of type 1 autoimmune pancreatitis (AIP), a relapsing steroid-responsive disorder. Objective We describe our experience with treatment of relapses and maintenance of remission using steroid-sparing immunomodulators (IMs) and induction of remission using rituximab (RTX). Methods We obtained details of disease relapse and treatment in 116 type 1 AIP patients from clinic visits, medical records and telephone interviews. We compared relapse free survival in those treated with IMs versus those treated with steroids alone, assessed patients’ response to RTX, and identified treatment-related complications. Results During a median follow-up of 47 months, 52/116 AIP patients experienced 76 relapse episodes. The first relapse was treated with another course of steroids in 24 patients, and with steroids plus IM in another 27 patients; subsequent relapse-free survival until a second relapse was similar in the two groups (p=0.23). 38 patients received an IM for >2 months; failure or intolerance of IM therapy occurred in 17 (45%). 12 patients with steroid or IM intolerance/resistance were treated with RTX, an antiCD20 antibody; 10 (83%) experienced complete remission and had no relapses while on maintenance therapy. Treatment-limiting side effects related to RTX were uncommon. Conclusions In type 1 AIP relapses are common. Relapse-free survival is similar in those treated with steroids plus IM compared to those treated with steroids alone. Nearly half the patients on IMs will relapse during treatment. RTX is effective in the treatment of both IM resistant and steroid intolerant patients. Although patients with type 1 autoimmune pancreatitis have a dramatic response to steroid treatment, disease relapses are common. There are limited studies describing treatment for relapses. Relapse-free survival is similar in patients treated with steroids alone versus steroids plus immunomodulator (IM) maintenance treatment. Nearly half of patients treated with IMs relapse during treatment. Rituximab treatment is highly effective for induction and maintenance of remission in patients with autoimmune pancreatitis with or without IgG4-related sclerosing cholangitis, including those who are resistant to IM treatment. Although over half (55%) of the patients might benefit from IM treatment, a significant group is resistant to IMs, so additional approaches are needed for patients with relapsing autoimmune pancreatitis. Rituximab treatment can be considered for such patients with difficult-to-treat relapsing disease. IgG4-related disease (IgG4-RD) is a multi-organ fibro-inflammatory syndrome characterised by typical histopathology in most affected organs (lymphoplasmacytic infiltration, storiform fibrosis and obliterative phlebitis), abundant (>10 cells/hpf) tissue infiltration with IgG4-positive cells, and frequent elevation of serum IgG4 levels.1 Pancreatic involvement in IgG4-RD is better known as autoimmune pancreatitis (AIP) and the biliary involvement has recently been named IgG4-related sclerosing cholangitis (IgG4-related SC). To prevent relapses in AIP, Kamisawa et al 2 advocate continuing all patients on low dose daily prednisone (2.5–10 mg) for months to years following induction of remission. In their series maintenance steroids appeared modestly effective, with a 34% relapse rate when steroids were discontinued versus 23% with maintenance steroids (p=0.048). Conversely, almost one-quarter of patients had another relapse despite receiving maintenance steroid treatment. These observations led us to successfully treat a patient with AIP and IgG4-related SC with RTX.13 We have continued using RTX for disease that is refractory to steroids and IMs, or patients intolerant to steroid treatment. Herein, we describe our experience using steroids, IMs and RTX for treating relapses in patients with AIP and/or IgG4-related SC. In addition to HISORt criteria, patients treated with RTX were also subjected to diagnostic review with the newly developed International Consensus Diagnostic Criteria for definite type 1 AIP (supplementary table S1).14 ,15 One subject (#4) diagnosed with IgG4-related SC without pancreatic involvement had diagnostic histology from a resected bile duct specimen. All patients in our database have been continually followed by in person visits and telephone interviews. For patients with history of biliary involvement, liver tests were obtained every 3–6 months. For patients who were unable to return for visits, original imaging and laboratory studies were reviewed, and patients were contacted to verify the accuracy of their interval health history. The date of last clinical follow-up was defined as the last contact with a treating physician. The administrative date of censorship for determination of relapse free survival was 1 July 2011. Patients received one of three initial treatment strategies: (1) surgery (pancreatoduodenectomy, n=25; distal pancreatectomy, n=4); (2) medical therapy (prednisone, n=77; RTX, n=2); or (3) supportive therapy (observation or endoscopic intervention without medical therapy, n=8). The protocols used for corticosteroid, IM and RTX therapy are shown in table 1. Disease monitoring used in the steroid protocol has been previously discussed in detail.7 For patients who either developed a recurrence of disease during the steroid taper (ie, recrudescence) or developed a relapse after steroid discontinuation, we re-treated with a repeat course of oral steroids followed by a taper. At the first relapse we generally started maintenance therapy with a steroid-sparing IM (table 1). This was started either simultaneously or soon after reinstituting steroids, then patients were weaned off prednisone over 2–3 months. Patients who developed relapse during maintenance treatment with an IM or who were steroid intolerant were treated with RTX according to a previously described protocol.9 ,13 Liver function tests were typically performed on a weekly basis during the induction phase, if indicated, and radiographic assessment repeated 8 weeks following completion of the induction phase to evaluate for treatment response. If a response was demonstrated, maintenance infusions were continued. Relapse following completion of steroid treatment was defined as the development of imaging findings or liver test abnormalities consistent with a new or worsening inflammatory process. Symptoms in the absence of biochemical/radiographic abnormalities were not sufficient to diagnose relapse. Biliary relapse was typically diagnosed on the basis of a new stricture on cholangiography or MRCP; however in patients with previously documented biliary tract involvement, relapse was also diagnosed in the absence of imaging when liver tests were >3 times the upper limit of normal and normalised with treatment. Recurrence in the pancreas included development of a new mass or swelling of the pancreas with or without biochemical pancreatitis or jaundice. Relapses involving other organ involvement (OOI) (eg, retroperitoneal fibrosis or renal lesions) were defined based on their typical appearance on cross-sectional imaging. Isolated serum IgG4 elevations alone were not considered relapses. Other definitions for treatment response and resistance are shown in table 2. Data were analysed using JMP V.9.0.1 (SAS Institute, Cary, North Carolina, USA). Due to non-normally distributed data, continuous variables including follow-up times were reported as median values and compared with the Wilcoxon rank sum test. The χ2 test and Fisher exact tests (when one or more expected cell frequencies were <5) were used for comparison of proportions. Relapse free survival from the first to second relapse was determined with the Kaplan–Meier method. A p value <0.05 was considered statistically significant. Clinical follow-up of at least 3 years or at least once within the 12 months preceding censorship was available for 102/109 (94%) living patients. Patients initially treated with surgery were more likely to present with a mass, normal serum IgG4 level, and without proximal biliary disease or OOI (table 3). Median clinical follow-up for all patients was 47 months (3.9 years; IQR 21.6–75.6 months). In the 113 patients with at least 1 month of follow-up from diagnosis, 52 experienced at least one episode of disease relapse during the study period. Seventeen patients experienced multiple relapses, with a cumulative total of 76 relapse episodes among all patients. Eight patients had an episode of recrudescence, almost always manifesting as a new rise in liver tests during steroid taper. The biliary tree (proximal>distal) was the most common site of relapse, followed by the pancreas (supplementary figure S1). Overall the cumulative rates for having at least one relapse were 35% at 12 months, 42% at 24 months and 46% at 36 months. Relapse rates were higher in those initially treated medically than surgically, with 12 month relapse rates of 48% and 11%, respectively (p<0.001). A total of 41 unique patients were treated with an IM (AZA, 6-MP, MMF or cyclophosphamide) during the study period. Since some patients were treated on multiple occasions, the details of unique episodes of IM treatment are summarised in table 4. Patients were most likely to be treated with an IM at the time of their first relapse (n=27), followed by the second (n=12) and third relapses (n=1); 10 patients were started on an IM prior to their first relapse, typically due to IgG4-related SC at disease presentation. Of patients experiencing a first relapse, 24 were treated with steroids alone, nine of whom had a subsequent relapse, and 27 were treated with steroids plus an IM, eight of whom had a subsequent relapse, six of which occurred during IM therapy. The resultant relapse-free survival was not statistically different between these two groups (p=0.23, figure 1). The clinical profile of the groups was similar, with the exception that patients in the group treated with steroids alone were more likely to have a greater than twofold elevation of serum IgG4, and the interval between their initial diagnoses to relapse was longer (median of 10.5 vs 5.9 months, p=0.02) (supplementary table S2). Relapse-free survival from the first to second disease relapse based on treatment strategy given for the initial relapse episode. The number of patients at risk during each time interval is shown in the table below the graph. Considering all time intervals, failure of IM therapy was attributed to drug intolerance in two and resistance to drug treatment in 15 (either a relapse while on treatment (n=9) or inability to wean off prednisone within 6 months of IM initiation (n=6)). The primary factor that appeared to be associated with IM resistance was the presence of OOI, particularly retroperitoneal fibrosis (table 5). Nine (22%) patients required drug discontinuation (AZA or 6-MP) for the following reasons: nausea/vomiting (4), transaminitis (2), bacteraemia (1), drug rash (1), and myelosuppression (1). Five patients who did not tolerate a thiopurine bacteraemia were transitioned to mycophenolate and one patient from 6-MP to AZA, with no further treatment-limiting side effects. Three additional patients required dose adjustments due to myelosuppression. The majority of the 12 patients treated with RTX were male (92%), over 60 years of age at diagnosis (mean age 66 years), and IgG4 seropositive (67%). Disease specific indications for RTX were predominantly biliary and pancreatic disease that was resistant to IMs with or without steroids (n=8 patients) or due to steroid intolerance (n=4 patients) (table 6). RTX therapy was began a median of 20 months following initial diagnosis of IgG4-RD (range 0–29 months). Eight patients received medical and/or endoscopic therapy concurrently with RTX (table 7). Prednisone was discontinued following the induction phase of treatment in four of the five patients who were on steroids, and biliary stents were removed in two of three patients without recurrent cholangitis, jaundice or worsening liver biochemistry. Following induction therapy, 10 patients achieved complete remission, one achieved partial remission before a malignancy was identified which led to cessation of therapy, and one had incomplete remission (table 7). All subjects experienced symptomatic improvement during the induction phase. One partial responder (subject #3) had cholangiographic improvement with resolution of a distal common bile duct stricture; however additional investigation revealed a synchronous invasive cholangiocarcinoma as the explanation for a persistent left main hepatic stricture and abnormal liver tests. The incomplete responder (subject #5) had stable hilar and common hepatic strictures on follow-up imaging 2.5 months after RTX initiation, but required ongoing use of prednisone. Otherwise, he subjectively felt well and maintained normal liver biochemistry. Of the 10 patients with radiographic follow-up, eight had complete radiographic remission documented at a median 4.5 months (range 2.3–9.9 months). The other two patients (discussed above) had either improved or stable biliary disease. The patient with the longest time to response (subject #4) had slight interval improvement at 4 months, suggesting that further treatment was reasonable. Otherwise, all patients had radiographic improvement following the initial four induction doses of treatment. Representative images of radiographic response are shown in supplementary figures S2–S4. Seven patients had abnormal liver tests at disease presentation or relapse. Three of these patients were initially treated with prednisone, and their liver tests normalised prior to RTX initiation. Three of the four remaining patients (subjects #2, 6 and 11) attained complete normalisation of their liver biochemistry on RTX. The biochemical non-responder (subject #3) was discussed previously. Six patients had normal serum IgG4 levels at the time of RTX initiation, including two who were previously seropositive. Four patients (subjects #3, 6, 8 and 12) had complete serologic normalisation with treatment, while the remaining patient (subject #2) had a dramatic decrease to less than two times the upper limits of normal (figure 2). In these patients there were variable decreases in IgG1 and IgG2 levels, with minimal changes in IgG3 levels (not shown). The final seropositive patient (subject #9) had minimal elevation at the initiation of treatment (129 mg/dl), and did not have serial levels measured during follow-up. Serum IgG4 subclass measurements following initiation of rituximab treatment for subjects #2, 3, 6, 8 and 12. The normal serum IgG4 value is 135 mg/dl. Follow-up during the maintenance phase (median follow-up 10.6 months) did not reveal any disease recurrence. However, one patient (subject #2) developed weight loss and symptoms of steatorrhoea more than 2 years after completing 24 months of RTX therapy. CT imaging demonstrated recurrent diffuse pancreatic enlargement with retroperitoneal fibrosis. He resumed RTX treatment, with symptomatic and imaging improvement. Three subjects had RTX -related side effects. One (#10) had an infusion reaction (chills and headache) during the first infusion that did not recur with subsequent infusions. Another subject (#3) developed late-onset neutropenia (absolute neutrophil count <250/μl) 2.5 months after the initial infusion, necessitating the use of granulocyte-colony stimulating factor (G-CSF). The following infusion was delayed by 1 week without any further myelosuppressive or infectious sequelae. Finally, subject #2 was diagnosed with probable bronchiolitis obliterans organising pneumonia, which has been rarely associated with RTX.16 Bronchoscopy was negative for infectious organisms, and his pulmonary infiltrates improved with steroid therapy. We report our experience with treating patients with relapsing AIP with or without IgG4-related SC using a step-up approach, first using a steroid-sparing IM and then, if necessary, RTX. 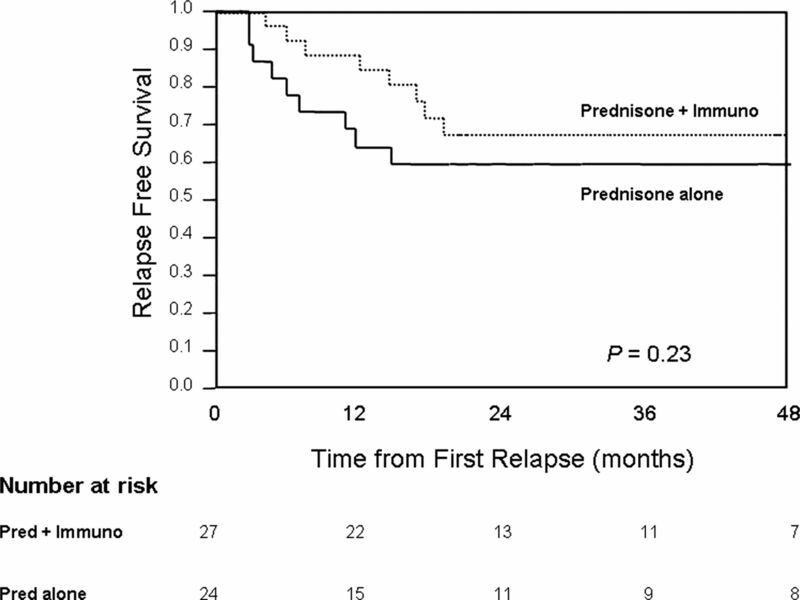 Although over half the patients treated with an IM were successfully maintained in remission off prednisone, we were unable to show that treatment of relapse with this strategy prolonged relapse-free survival compared to treatment with another course of steroids alone. Also, almost half the patients treated with IMs either did not respond to therapy or relapsed on full dose immunosuppression despite a period of remission. In 10/12 patients with steroid intolerance or IM resistance, treatment with RTX achieved complete remission, making it a promising alternative in the difficult-to-treat patients. Evaluating effectiveness of treatment for AIP in randomised controlled trials has so far proven difficult as it is a rare disease whose diagnostic criteria have only recently been agreed on. Also, in IgG4-RD, disease activity is heterogeneous, with various organs showing inflammatory changes at varying points in time. This study and previously published reports, therefore, are observational studies reporting treatment effectiveness. Nevertheless, our observations provide valuable insights into managing the disease. Our decision not to treat all patients with maintenance therapy, but only use it in those with at least one relapse or a high likelihood of relapse (eg, those with proximal biliary disease), appears to be a reasonable strategy because nearly half of our patients did not relapse even at 3 years, and when relapses did occur they were treatable.7 Unfortunately, the different approaches to patient selection for maintenance treatment makes it impossible to directly compare our results with those of Japanese studies in which all patients were started on maintenance low-dose steroids after their initial course of steroids, regardless of the predicted risk for relapse. In the group of patients who were resistant to IMs, there were many with OOI, particularly retroperitoneal fibrosis. It is likely that patients with extensive non-pancreatobiliary disease are poor candidates for IM therapy. Until alternative approaches are firmly established, we continue to at least consider IM (eg, AZA) therapy in patients with proximal bile tract involvement, or those who develop at least one objectively documented disease relapse. We have gained additional insights from our experience of treating AIP with IMs. Early on we realised that doses of AZA used in inflammatory bowel disease (2.0–2.5 mg/kg) rather than the fixed dose of 50 mg used in autoimmune hepatitis, are needed for maintenance of remission. Additionally, in patients with evidence of active inflammation (either biochemical or radiological), withdrawal of steroids (to doses <20 mg/day) and transitioning to AZA monotherapy is likely to fail. Therefore, we withdraw steroids only after all evidence of active inflammation has resolved, and then taper steroids over 6–8 weeks after starting IM therapy. This can be especially difficult in subjects with diabetes who are often intolerant to >20 mg/day of prednisone. Finally, it appears that 6-MP, AZA and MMF have similar efficacy and can be substituted if there is intolerance to one drug. One-quarter of our patients on IMs experienced treatment-limiting side effects, ranging in severity from mild (eg, nausea, asymptomatic liver enzyme elevation) to severe (eg, bacteraemia). Over half of these patients tolerated changing to a different class of immunosuppression (ie, MMF). Although these figures may seem high, they are comparable with previously reported rates of drug discontinuation in 10–30% of inflammatory bowel disease patients receiving either AZA or 6-MP.18 The risk of side effects needs to be balanced against possible benefits for each individual, taking co-morbidities into account. What is the optimal dose and duration of RTX therapy? Khosroshahi et al 17 reported successful induction of remission in IgG4-RD after only two infusions of RTX 2 weeks apart without maintenance dosing in patients with predominantly extra-pancreatic involvement. While none of our patients have had disease relapse during the maintenance phase, in their series 4/10 patients required additional RTX treatments by 6 months, suggesting that induction treatment without maintenance therapy might be associated with higher relapse rate.17 Perhaps using maintenance RTX only in those who relapse may be a cost effective approach to managing AIP and IgG4-SC. Additional clinical experience will improve our understanding of the difference in relapse rates between these two strategies. Should RTX be offered as first line therapy for AIP and/or IgG4-related SC? We believe a step-up approach to RTX therapy is most reasonable at this time, because only a minority of patients will have relapsing disease refractory to steroids and IMs, RTX therapy has considerable costs, and available data regarding RTX are limited (figure 3). Mayo Clinic treatment algorithm for management of disease relapses for patients with firmly established (ie, cancer has been excluded) autoimmune pancreatitis and/or IgG4-related sclerosing cholangitis. In summary, we were unable to show that treatment with IMs is better than treatment with an additional course of steroids alone for maintenance of disease remission in patients with relapsing AIP. Although some patients could be maintained in disease remission with IMs, almost half of the patients relapsed during IM treatment. In this setting, as well as steroid intolerance, RTX is effective for treatment of AIP and IgG4-related SC. Clinical response to RTX treatment is high, and based on our limited follow-up, the risks of disease relapse and treatment-related side effects were low. These observational data showed no definite benefit of using IMs and support the role of RTX for treating IgG4-RD, but future larger studies are needed to help refine clinical indications and dosing protocols.
. Differences in clinical profile and relapse rate of type 1 versus type 2 autoimmune pancreatitis. Gastroenterology 2010;139: 140–8; quiz e12-3.
. Review of 67 patients with autoimmune pancreatitis in Korea: a multicenter nationwide study. Pancreas 2008;37: 377–85.
. Treatment of benign orbital pseudolymphomas with the monoclonal anti-CD20 antibody rituximab. Mayo Clin Proc 2007;82:692–9.
. Treatment of pemphigus vulgaris with rituximab and intravenous immune globulin. N Engl J Med 2006;355:1772–9.
. Diagnosis of autoimmune pancreatitis: the Mayo Clinic experience. Clin Gastroenterol Hepatol 2006;4:1010–16; quiz 934.
. Pulmonary toxicities of biologics: a review. Anticancer Drugs 2010;21:131–9.
. Rituximab for the treatment of IgG4-related disease: lessons from 10 consecutive patients. Medicine 2012;91:57–66.
. Treatment of inflammatory bowel disease with azathioprine and 6-mercaptopurine. Gastroenterol Clin North Am 2004;33:209–34, viii.
. Rituximab monotherapy with eight weekly infusions for relapsed or refractory patients with indolent B cell non-Hodgkin lymphoma mostly pretreated with rituximab: a multicenter phase II study. Cancer Sci 2011;102:1698–705. Contributors STC: study concept and design; acquisition of data analysis and interpretation of data; drafting of the manuscript; critical revision of the manuscript for important intellectual content; statistical analysis; study supervision. JEC: acquisition of data; analysis and interpretation of data; critical revision of the manuscript for important intellectual content. FCG: acquisition of data; analysis and interpretation of data; critical revision of the manuscript for important intellectual content. PAH: study concept and design; acquisition of data; analysis and interpretation of data; drafting of the manuscript; critical revision of the manuscript for important intellectual content; statistical analysis. RRK: acquisition of data; analysis and interpretation of data; critical revision of the manuscript for important intellectual content. MJL: acquisition of data; analysis and interpretation of data; critical revision of the manuscript for important intellectual content. RKP: acquisition of data; analysis and interpretation of data; critical revision of the manuscript for important intellectual content. BTP: acquisition of data; analysis and interpretation of data; critical revision of the manuscript for important intellectual content. TCS: acquisition of data; analysis and interpretation of data; critical revision of the manuscript for important intellectual content. AS: acquisition of data; analysis and interpretation of data; critical revision of the manuscript for important intellectual content. NT: acquisition of data; analysis and interpretation of data; critical revision of the manuscript for important intellectual content. MDT: acquisition of data; analysis and interpretation of data; critical revision of the manuscript for important intellectual content. SSV: acquisition of data; analysis and interpretation of data; critical revision of the manuscript for important intellectual content. TEW: acquisition of data; analysis and interpretation of data; critical revision of the manuscript for important intellectual content. Competing interests MDT expects to receive grant funding from Genentech later this year. Ethics approval Mayo Clinic IRB.